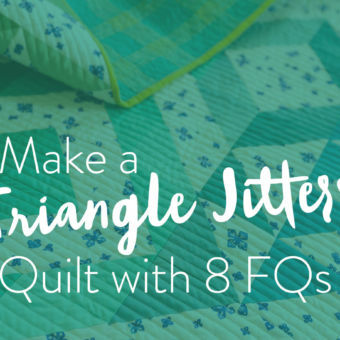 This post is your one-stop-shop in finding aaaaall of the information you need to know about quilt batting. You may want to go ahead and tab it now. 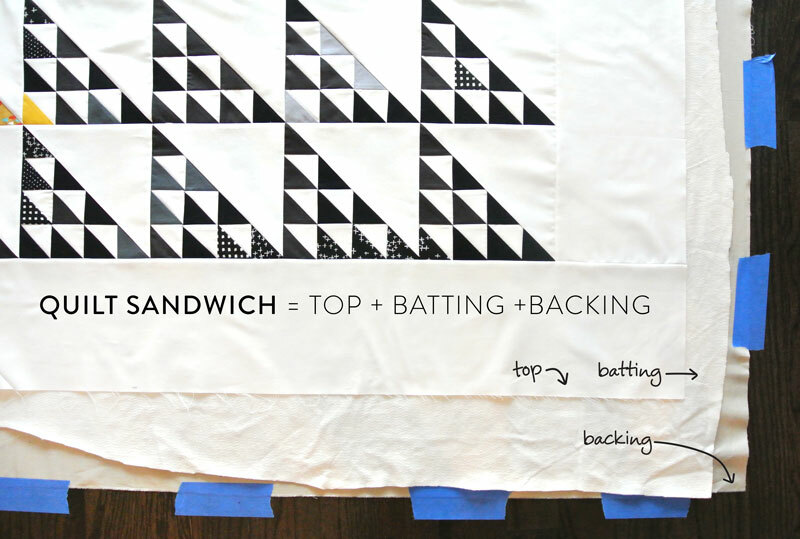 Oh and if you would like a sweet tutorial on how to baste a quilt, check out this post – it shows 3 different ways to baste your quilt sandwich. I'll wait....ready? Great! Let's jump in! I’m the kind of person who goes to the toothpaste aisle of the grocery store and talks to myself for like 45 minutes, with varying degrees of hysteria. I mean, why are there so many different toothpaste options?! And what is the difference between plaque and tartar? And is there actual glitter in that one? A few months ago I went on a soul-searching, quilt batting journey. I packed a small backpack, waved goodbye to my husband and walked off into the distance with a single goal in mind, "Find the perfect batting or die trying." I'm happy to report that after my strenuous campaign into the cotton fields of Mississippi, through the sheep herds of New Zealand, and even deep into the bamboo forests of China, I'm back. And now I'm back. With news. The biggest decision (and yes, I acknowledge that choosing how to finish off your quilt baby is a very big decision) comes down to material. Let’s highlight the four most common batting material choices, and what they’ve got going for them. Although cotton has a number of different sub-options, it’s a great choice for most quilting projects. Things to look for: cotton seeds in the batting. These can actually stain fabric, so beware! Cotton can also bunch after washing unless quilting lines are pretty close together. Read the package instructions to double check how closely your stitching should be. Allergies, anyone? A poly blend batting can be a great alternative to natural fibers if you’re on the sneezy side. Polyester blends also tend to cost less if you’re looking for a thrifty option. This type of batting is also easy to work with, and pretty low-maintenance. And warm. Yeah, 10 points for the poly blend! Unlike 100% cotton batting, poly blends don't change as much in size and drape after washing. 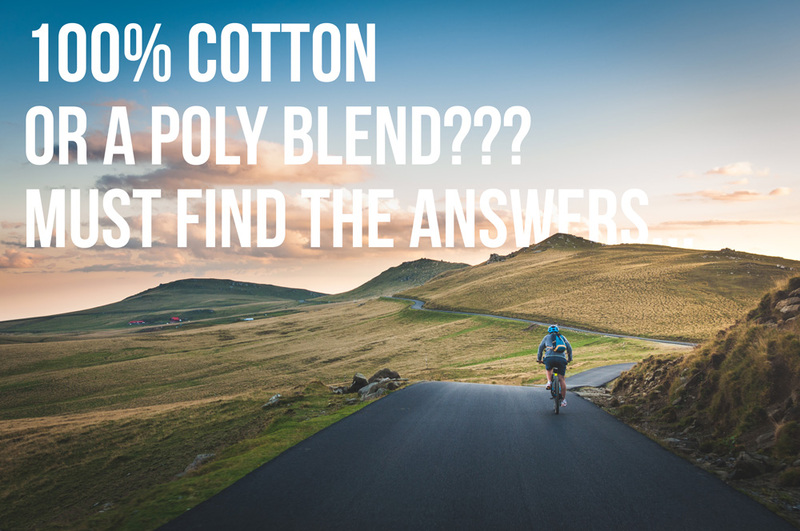 Keep in mind that not all poly blends will feel the same because the ratio of cotton to poly varies anywhere from 80/20 to 60/40. 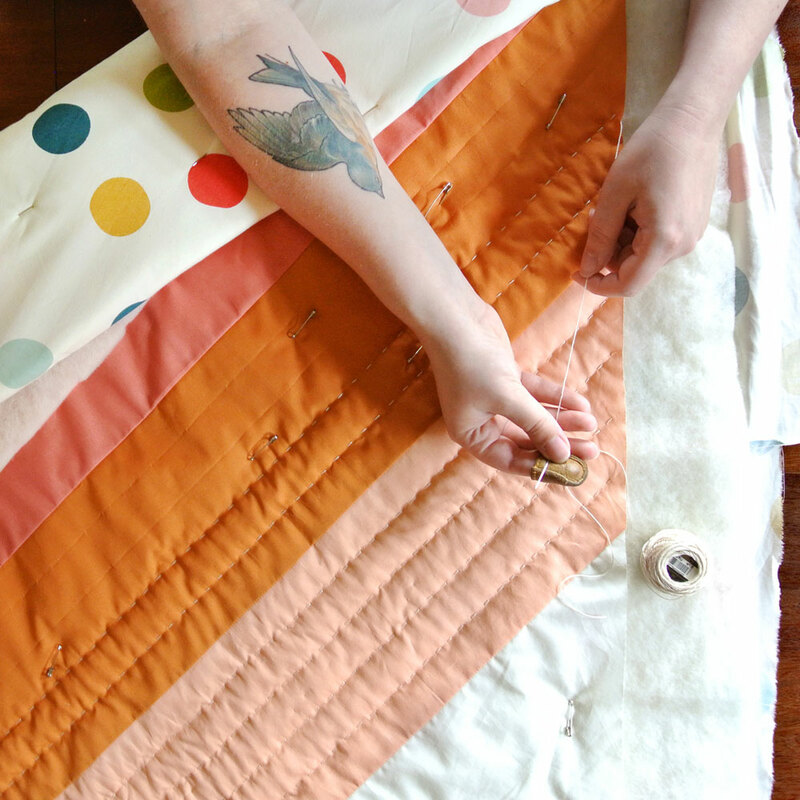 See more pics of this fluffy Maypole quilt here! AND Get the patter﻿﻿n! If it’s wool, you know it’s warm. It’s also veeeery fluffy and relatively easy to work with when quilting. 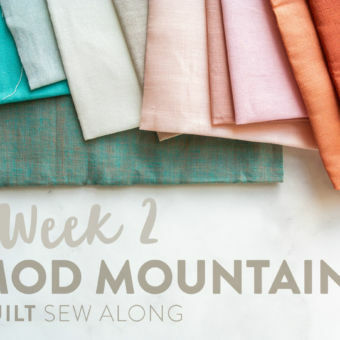 Wool will never get fold lines or creases, even after months of being folded, which is pretty awesome for you quilters out there with stacks on stacks of quilts filling various corners of the living room. You heard me right. But not the kind of beard you’re thinking of. Bearding, in the quilting world, is when fibers from the batting travel through the top of the quilt. It’s pretty common with wool batting, and basically looks like your quilt is growing a 5 o’clock shadow. So I guess it’s kind of a lot like the kind of beard you were thinking of. The best way to avoid bearding from your wool batting is to use a sharp needle (probably fresh from the package) when quilting and piece your quilt top with tightly woven fabric. If your fabric is a loose weave or a low thread count, the wool can easily travel through it once the quilt has been washed. Hopefully this gives you a pretty good preview of what all these materials have to offer, and what pricing you can expect (polyester on the low end, cotton, then wool, then bamboo at the top.) The other component that is going to affect the cost is which brand you choose. Oh, you’re wondering if I have any opinions about that? Muhahahaha! 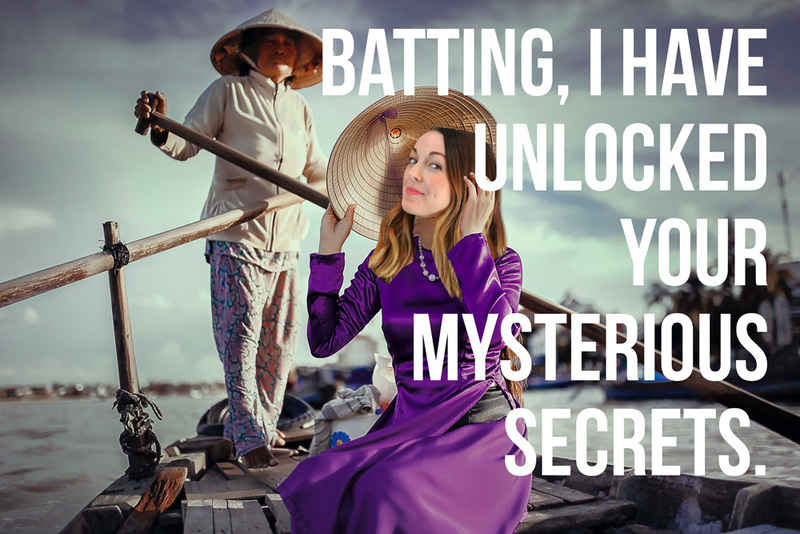 During my long and grueling quest to find the perfect batting, I met a spiritual guide...through a dream. A Quilter's Dream. And what a wonderful dream it was! 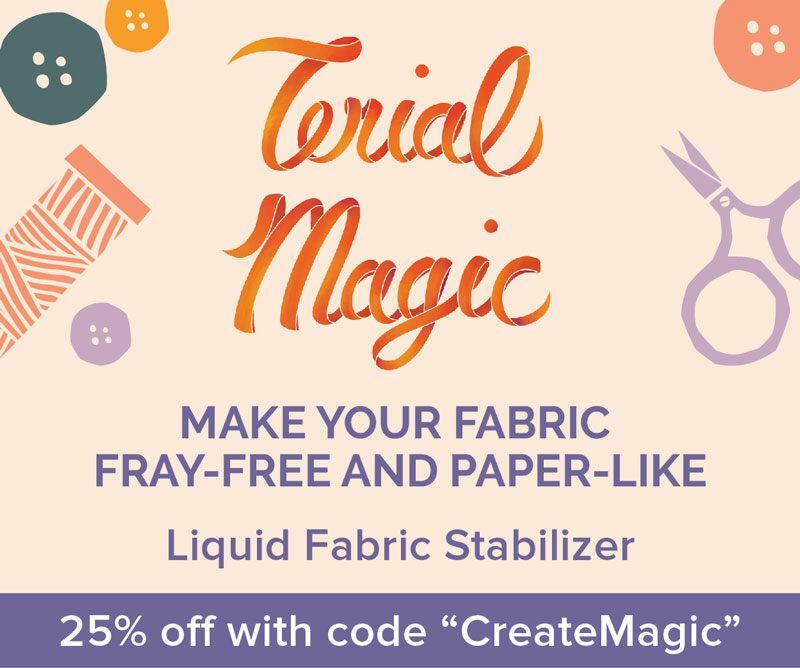 For those who like to shop online or only have access to big craft shops – this stuff is very easy to come by. I've tried all of the big box store brands, and Pellon is where I keep coming back. Go for “white” over “natural.” Now, this may be a more personal preference, but I always go for white batting because of the darker flecks found in “natural” cotton. Sometimes, these flecks can show through light-colored fabric, and with the crazy amount of white I use in my quilts, I have a strict “No Flecks Allowed” policy. Don't Get Too Lofty. One other term you should know when checking out batting is “loft.” Loft basically refers to how thick or fluffy your batting is, with lower loft being thinner. 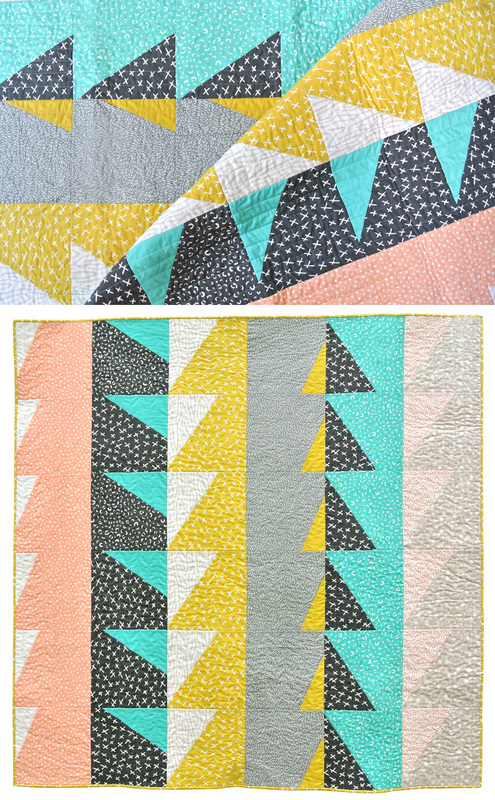 Low loft batting is great for a flatter finish, where you want to show off your piecing more than your quilting lines (though if you are hand quilting, choose low loft no matter how amazing your stitches are… it’s just easier.) Go for higher loft if you want a nice, puffy quilt with very visible quilting lines.​ However, keep in mind that if you get a high-loft batting it can look a bit dated – member those puffy Care Bear quilts from the 80s? 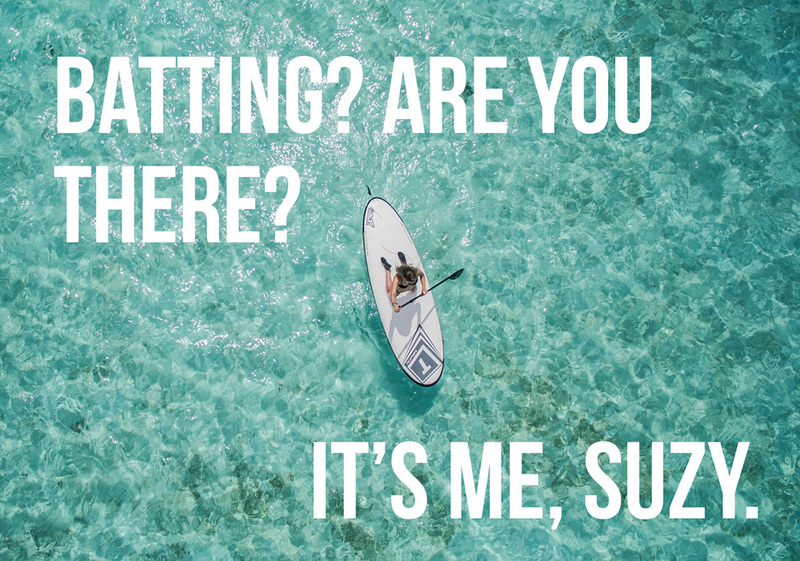 Suz, did I miss it?! Did you mention which one is your fav? Tutti girl, you missed nothing. I was very sneaky and intentional about not sharing a favorite. The truth is, sometimes it’s nice to switch it up! My favorite brands will probably remain Quilter’s Dream and Pellon, but within those brands, I will hop around among all of the options. I have never done that, but I doubt it would ruin the quilt. It may make it really stiff, but eventually, it would loosen up. If you haven’t tried wool batting yet, I suggest trying that before double layering. Good luck! I love Quilters Dream Wool Batting ❤️ It is warm in the winter but also so lightweight and cool for summer…My go to batting!! Choosing batting is such a weird mystery to me, so thank you for this! I always tend to like my quilts to be as drapey and floppy and non-stiff as possible. Do you find cotton of poly-cotton to be more drapey/less stiff? I’ll have to give bamboo batting a try sometime… that sounds awesome! I have found cotton poly blends to have a floppier drape straight off the sewing machine. 100% cotton batting is a bit stiffer and needs to either be washed or used a lot before it’s drape mimics the cotton poly. I always wondered why my quilts were stiff. New quilter here. Most informative article. I have a weird batting story… I finished a quilt recently that I started over ten years ago when I was young and had no idea I was using too many colours. When I found the top and got to finishing it, I really didn’t want to put any more money into it. So for batting I used polar fleece! Not even one piece! I sewed two different colors together! So now the whole quilt is weird, the top that I made when I was young and silly, and the finishing when I was older and still silly. I know this is an old post, but what you said about what they used to use reminded me. I bought an old ‘puffy’ quilt and I opened one of the puffs and they are filled with silk stockings. Not pantyhose, just silk (or maybe nylon), thigh high stockings. Very heavy and completely cool! This brought back a memory of when I was in high school (decades ago) and making stuffed animals. Not all of us were rich enough or stylish enough to have hosery for daily wear. So I had a “supplier” who would give me her old pantyhose that had runners to use as stuffing. BTW – just found your blog, Suzy, and LOVE all the tips! Too many colors? 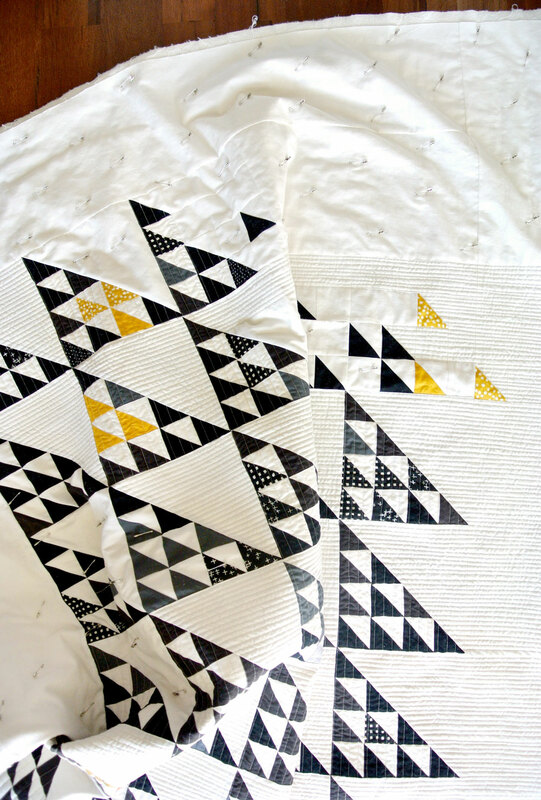 Check out Kaffee Fasset quilts! It’s a color riot and just fantastic!! 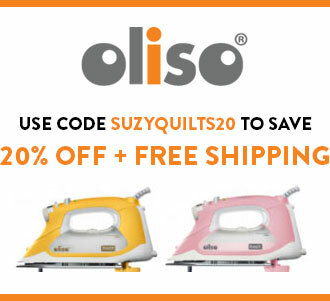 I have used both Hobbs and Quilters’ Dream wool batting and would rate them excellent. the high lofts on a longarm – I’m sure is fine for a tied super puffy look. Great info! Thanks for the comment, Sally. Great info – Thanks so much for the post! Did I miss the Warm and Natural? Did you not include it because it is not top quality? I would put Warm & Natural in the same category as Pellon in terms of availability and price. Personally, I think Pellon is better quality and never has those terrible dark flecks that drive me bananas. This is super helpful – and might get me to try a bamboo or wool in the future. On a similar note, what are your thoughts on spray basting? I had always pin basted until a couple weeks ago, when I tried spray basting. Long story short, it did not go well, even after I watched PLENTY of youtube tutorials. Any advice? I’ve spray basted in the past and have found pin basting to be the better option. Here are my reasons: 1. Spray basting was making a mess in my house. No matter how neat I was, that sticky spray would get on my floors, walls, and furniture. yuck. 2. That stuff is expensive! Pins are a one-time investment. 3. Safety pins don’t shift. When I spray basted anything larger than a baby quilt, my quilt sandwich would shift and get all out of wack. I don’t like spray basting at all! It is bad for your lungs and the environment, it leaves a sticky residue on your quilt, too. Even the directions on 505 say ‘to remove adhesive – dry clean’. No thank you, I ♥ my curved safety pins and I can remove them without professional help lol. How about silk batting? I’ve recently seen some of it and it is beautiful but where would it fall in your list? I usually use 80/20 because it doesn’t stretch or get misshapen like cotton can tend to. But another dreamy option is silk! Silk batting in a lawn or voile quilt is like the lightest, drapieat quilt ever. woooow!!! Ship me some of that! I’ve never tried silk, but now it’s at the top of my to-do list. I love the Tuscany silk by Hobbs. Do itttt! Regarding loft, when I started Quilting 20 years ago I remember 1/4 inch loft was desirable and easily available. Recently I was shopping for batting in brick and mortar stores and a majority of batting was 1/8 inch loft. What happened? I longarm quilts, the 1/8 is too thin, a piece of flannel would do as well. The experience left me disappointed and a little bit frustrated. Am I alone? You’re definitely not alone. I have found it common for cotton batting, specifically, to be thinner and denser than it used to be. 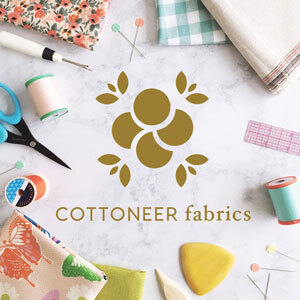 If you are looking for a batting that is closer to 1/4″ in thickness, you will have to shop “deluxe.” Try out Quilter’s Dream 100% Pure Cotton Supreme if you haven’t already. I tried the Quilters dream wool and it started bearding heavily as soon as I started quilting it. Is there a way to minimize the bearding? In your experience which one beards the least of the wool batting? You are seriously one funny lady. I will continue to stalk you. Hi, my husband and I are in the process of house hunting for the perfect acreage. My big dream is to raise alpacas and make quilt batting from their fleece. Were we live right now there is a place that will process alpaca fiber (75% alpaca, 25% wool) into batting for an astonishingly reasonable price. In your pilgrimage of finding batting…did you come across alpaca fiber batting? Any thoughts on that type of batting? My understanding is that it is lighter, warmer, and contains less lanolin than wool and easy to quilt/work with. I have used alpaca and it is wonderful. It is lighter yet warmer than wool and most people who are allergic to wool are NOT allergic to alpaca. It’s pricy but I think it’s worth it in some cases (like baby quilts). Do you have any thoughts on fusible batting? I used fusible batting on my first quilt, a bedspread sized beast for my son. Putting the quilt sandwich together turned out well but was no fun – yes down on my knees on the floor. I hand quilted it for about three years then got impatient and asked a friend to longarm it. She tried. The thread kept breaking so she handed it back to me. Even hand quilting I could only use short pieces of thread because of breakage. I finally finished it before my son graduated from high school. To top that off, when I finished, I washed it to get the adhesive out and the thing started bearding. Don’t touch that stuff. Very useful info. Thanks! Do you have a recommendation on what kind of batting to use for tablecloths or placemats, since they have to be washed more frequently? I once heard someone that said she used flannel as batting, but I thought flannel shrinked a lot. Thank you for your advise. Great question! Flannel won’t be any sturdier than 100% cotton batting, however it will be a lot thinner. I have used both 100% cotton and cotton poly blend batting in placemats and table runners and years later they are still in great condition. If you don’t want the crinkle affect, pre-wash your fabric before making your placemats. That was the one thing I didn’t do that I wish I did. Oh! And one more thing you may want to consider – I used a heavy-weight home dec fabric on the back of my placemats to give them a bit more heft and make them sturdier. I think that helped a lot. Good luck! Thank you so much! Very useful. If the fabric is prewashed, won’t the batting still shrink? Making the item still crinkle? Most batting comes preshrunk, but yes, inevitably both the prewashed batting and prewashed fabric will still shrink a small amount on the second wash anyway. In fact, if you’re using cotton thread, that will even tighten up a bit too. Prewashing your fabric will lessen the crinkle, however. Good post altho, none of this information is new. One thing I didn’t see mentioned about cotton batting: if you are making a wall hanging/art quilt, do NOT use cotton. It has a “memory” meaning that, once your work is folded, it will retain fold lines unless and until the item is steamed (and sometimes, even after steaming). So, unless you can assure the piece will be rolled and not folded, stick to wool, poly or some blend. I just discovered your blog and I’m finding all sorts of useful information. Thanks! I was happy you mentioned the poly/blend option to remind me that even though I always brush off the idea of something synthetic, I really should use a poly for my niece who is an allergy sufferer. Piecing her a birthday quilt today but if it makes her eyes water then a lifetime heirloom is just going to be a waste 🙈. Good call! Thank you so much. It’s not the first time I’ve made a quilt, but it’s definitely the first time I’ve done it properly! 🙂 I really appreciate your writing as much as your helpful tips, knowledge and reviews. Are there restrictions to washing and drying quilts using wool batting such as dry cleaning or not putting it in the dryer? I love it! That’s the only bamboo batting I use and it’s what’s featured in this post. I’m so thinking about using the bamboo batting. Can it be washed often? I suffer from dust mite allergies and keep searching for the best option. Yes, and it’s very durable! Hi Suzy!! Read and reread your awesome article and the comments– but I see no mention specifically of Mountain Mist Cream Rose cotton needled batting. I ask because someone gave me some and I can’t find a lot of info on it. Was wondering if you have heard of it?? Should I use it with a large quilt top I LOVE– or save it for the projects going to lesser loved family members?? 😉😂. jk…I love all my family dearly!! Thanks!! I’ve never personally used this batting and to my knowledge, it’s only sold at Joann’s. Does that sound right? I think you should try it out on a baby quilt and decide what you think after that. Do you like the drape? Does it beard? Does it feel nice after washing? If you are still liking it after all of that, get more! The price of this stuff is really great. As a new quilter I tried the Quilters Dream Green, made from recycled bottles. It was lovely to work with and my 90” square quilt is a nice weight. However now I’ve read about the dreaded bearding I’m worried about using it again without advice. Has anyone found a problem with this wadding? You should be fine. Wool batting is the type to cause bearding, and I’ve yet to happen to myself. I think you would really notice it if you used a lot of dark fabric. Wondering what you think about polyester batting? I have the Hobbs Polydown quilt batting. I also use a thin polyester placemat batting for placemats and runners. I think poly batting has it’s place and in the end it’s about how you want the quilt to feel and how you will be using it. Because it’s synthetic, it shouldn’t beard, so it would be a good option for quilts that use a lot of dark fabrics – especially if you’re using solid dark fabrics. Poly battings typically drape well too, so if you want that extra soft drape, it will be nice and cuddly right out of the bag. Thanks for a great article – very informative. 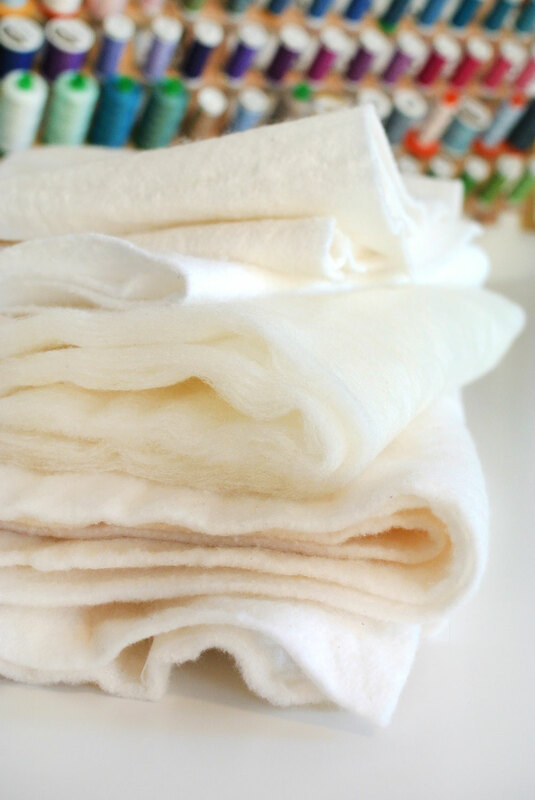 I’ve only ever used 100% cotton and 50/50 bamboo/cotton wadding (which is dreamy!). Working on my first real quilt for me (having made many as gifts) and am already considering which batting to use – I want to try wool, but am worried it might be too ‘lofty’… personally, I like a fairly flat quilt finish. Also considering silk wadding (well, it’s a blend of Silk, Bamboo, Botanic Tencel and Cotton). Was delighted when I found an online supplier who does a wadding sample pack, which includes all the ones I would like to try! Needless to say I’ve ordered the sample pack and can then test them all and compare the results. I guess I should wash the samples, after I’ve quilted them? Washing the samples after quilting is a great idea. I hope you enjoy silk! That’s one I still haven’t tried. Recently I’ve gotten a little addicted to Quilter’s Dream Deluxe Poly. It’s thicker and more dense than regular poly or cotton, but not as puffy as wool. I have a question on bamboo batting. I have a long arm quilting machine and had a customer bring bamboo batting which was so soft to the touch and the look was very nice. The problem I had was with thread breaks while using it. Is this a common problem with long arms or do you need to use specific thread types with it? I found this information to be helpful as I have mainly used Hobbs batting or Warm & Natural from customers. 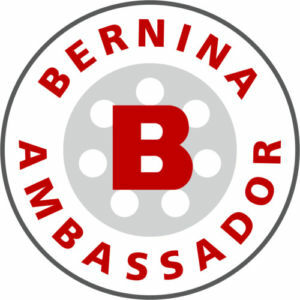 Thread breaks…hmmmm…this is not something I have experienced with bamboo batting, but I only sew on my domestic machine – a Bernina to be exact. You would know more about long arms than me, but any time I have thread breaking on me, I change my needle and, if needed, change to a slightly thicker thread. Are you currently using 40 wt? Maybe see if that helps? 2) I read the customer comments about the orient blend bamboo batting and they mention “too much lint” – I guess this means during sewing? Is this a problem after it is sewn? Man I said 2 questions, but that turned into 4! 1) Nope! Most packaged batting does not need to be prewashed and it should say so on the usage instructions. 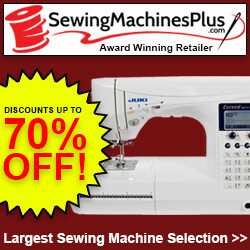 If you are using Pellon, Quilter’s Dream or Hobbs (the big names), none of them require it. 2. Lint from bamboo? Gimme their emails cause I don’t believe them. Well, I guess I should admit that once I found Quilter’s Dream Bamboo batting I refuse to use any other brand, so maybe the other brands create lint? I wouldn’t think so…but anything is possible I suppose. 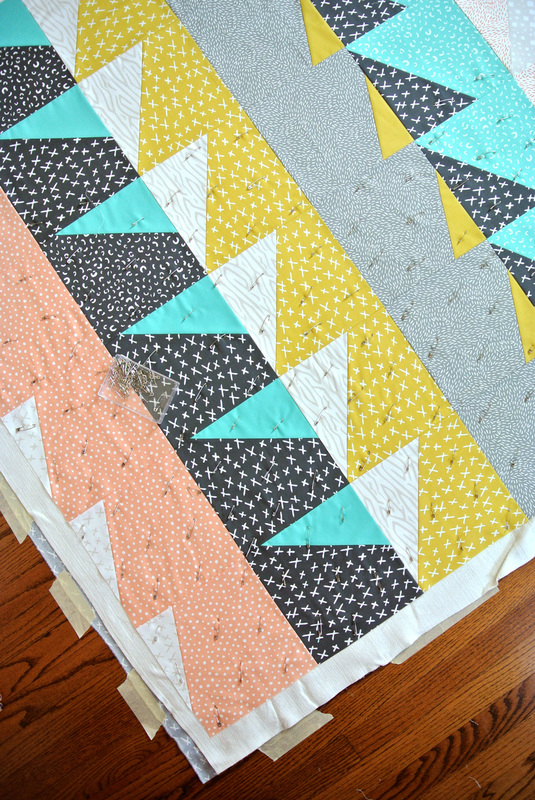 Quilt with a sharp 90/14 needle (so it pierces and doesn’t punch), and you should be fine. I am only tying the knots to hold the quilt – not actually quilting! I designed a sunrise scene over an ocean and the fabric pieces are big. I found a cool trick on a YouTube tutorial for making the quilt sandwich using skewers to center it. The amount of math involved in designing this thing would make Einstein flinch. But what a fun winter project it has been!!!! Oh and the “lint” complaint was from 2 different customers on the Amazon site for Quilters Dream Orient Blend. They said they had to clean the bobbin after every line. SILK! My new favorite batting for hand quilting. Drapes beautifully. It’s white! VERY consistent thickness (mid-loft, but quilts like a low-loft) for a blend (blended with bamboo, cotton, and tencel). AND – it’s forgiving of wide unquilted areas – up to 8″. OK, it’s a bit pricey, but you’re gonna spend weeks, maybe months working a quilt to cheap-out on the batting? Nope. Worth the money. How warm is the silk? I am making a summer quilt for our bed and want it to be very lightweight. My lqs recommended “Quilter’s Flannel” as the batting but I’m worried about shrinkage and also I don’t know where to buy that. I am considering silk and also bamboo as an option. I want the quilt to be very thin and very lightweight for this menopausal mama. 😊😊 Any tips would be appreciated. I’m not familiar with silk, but I think bamboo batting would be a great choice. It’s lightweight and has a soft drape. 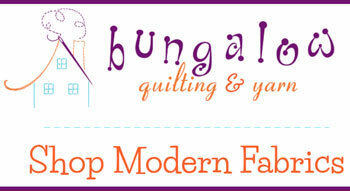 I use Quilters Dream bamboo. I prefer a cotton batting for my projects but my concern is the weight of a quilt as a cover for a baby. 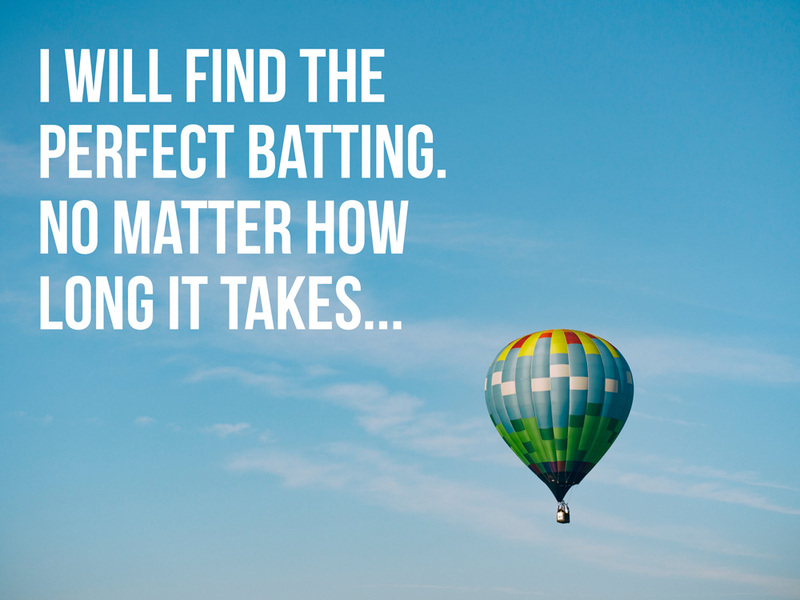 do you have any advice as far as batting is concerned? Unless you are using a few layers of batting, none of these options are weighted enough to cause any issue. Hey Molly, thanks so much for your input! 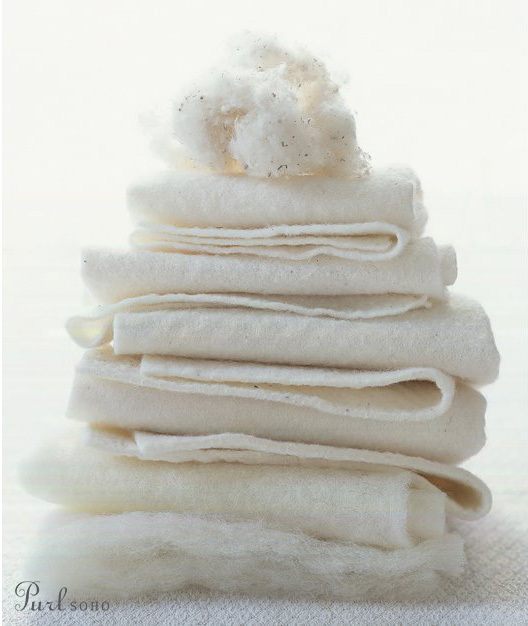 What makes you say that wool is not suited for washing? I haven’t heard that. I think a lot of quilters opt for cotton batting because it is the most prevalent in stores. However, like you say, it’s not the warmest material out there. I use wool batting a lot (the brand is called Mathildas Own, it’s from Australia). I wash all my quilts in my washing machine (no dryer) and never had a problem with bearding ! The loft is a little bit more than cotton. Quilters Dream batting comes preshrunk, so you won’t need to prewash it. I am making my first quilt ,and my next step is the batting . Thanks for sharing your wisdom. I didn’t have time to read all the comments to see if this was addressed but do you know which batting is less flammable? Just curious. hmmmm….I would be guessing, but my guess would be wool. In reply to fire retardent batting (angel), it makes me wonder if the chemicals used are safe for babies? I think chemicals in the batting are probably fine since they won’t be directly touching skin, but when it comes to babies, never use a product that makes you uncomfortable. I am making quilts for a ministry and I’m looking for the lightest batting to save cost on shipping. A 60/40 cotton poly blend would probably suit you best. Do you know the loft of Warm & Natural? How would it compare to Pellon White Cotton? I used the former on my first quilt and am happy with the loft and warmth. I am now making 2 twin quilts for our guest room and am tempted by your suggestion of Quilters Dream, but $40 for 9 yds might win me over to the Pellon! Thanks for all the great advice throught your site! Warm & Natural is very comparable to Pellon. It’s similar in quality, however BEWARE of natural dark cotton specks. They will show through light fabrics. If I use that brand I tend to stick with Warm & White (no dark specks). My major beef with Pellon and Warm & White is that after years of getting them, I found both to be inconsistent and both actually seemed to be getting thinner with every passing year. I guess the companies were trying to save some money? I trust the consistent quality of Quilters Dream. I like all of the options on loft and type they offer. If the price is a hinderance, maybe just get it for those very special quilts you know you’re going to spend some extra time on. 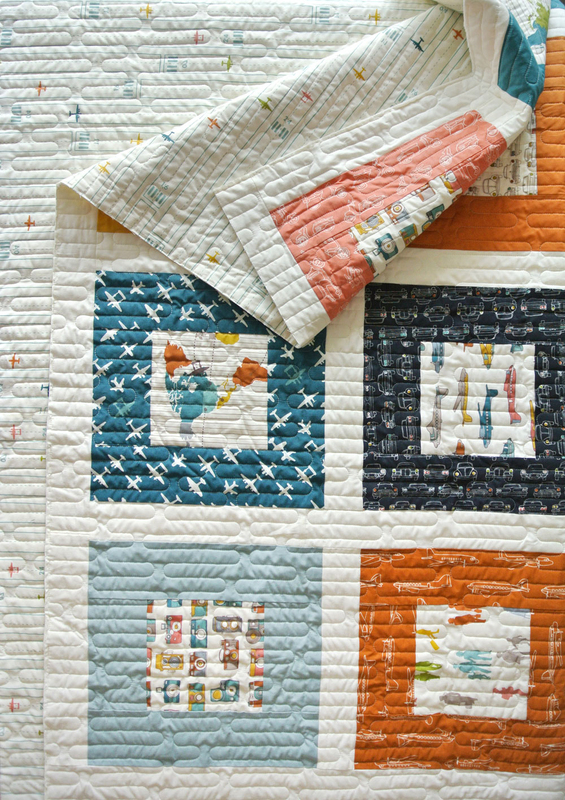 I saw in a comment you really like Quilter’s Dream Deluxe Poly and that is the one I want to try, but I cannot find it anywhere! It’s no longer on Amazon. Where do you buy it? Wow that stuff has gotten hard to find! I wonder why. I found some on ebay, but that’s not a good sign. 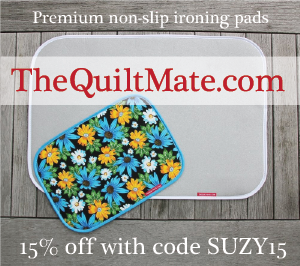 I just emailed my contact at Quilters Dream to see if they are phasing out that product. I’ll let you know what I hear back. I’m back with an answer! My contact said that it can still be found on Amazon (eh…questionable), but can definitely be found at batt-mart.com. Do a search on the page I just linked to for “Deluxe” and you’ll find all of the Poly Deluxe options. Hi Suzy! Love your site. I keep getting request for a heavy quilt. Any suggestions? 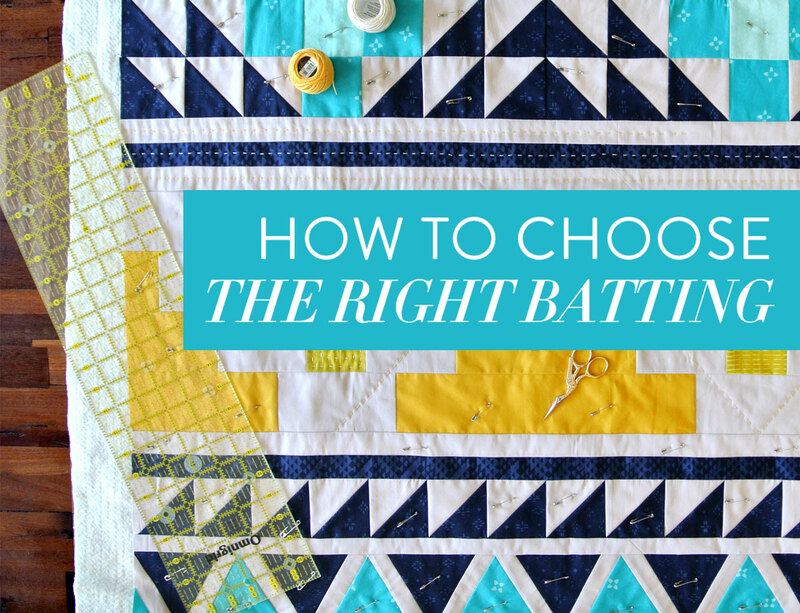 Would it be batting choice or fabric choice that makes a quilt heavier? Thanks! Well, if you want a really heavy quilt, you’re best bet is to pick both heavy-weight fabric and batting. Do you want the quilt to be soft and warm, or just heavy? haha! 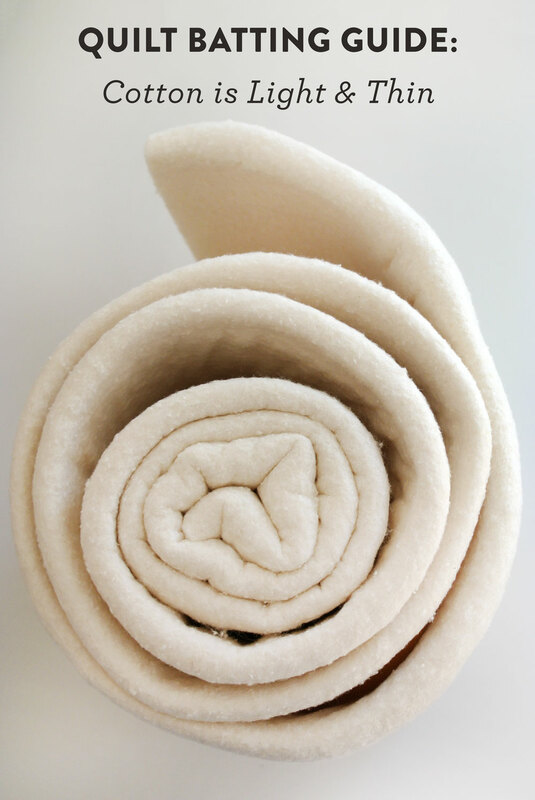 What batting would you use between two layers of fleece? My mom made three of my children warm, heavy quilts like this before she died. We have since added two more children to our family. I would like to make them quilts just like this. A quilter friend advised me not to use batting in between. However, after seeing how well these quilts have held up with use EVERY single day for 10 years. I really want to make one just like it. Any advise? Thank you. .
I’m wondering if you ever make a wool top, as for a wall hanging, with a cotton back. My wool is felted and has an appliqué tree – Sue Spargo style. I’d like to quilt it by machine, but I’ve tried several battings and so far they all creep to the top – even when I change the tension. I’m using a sit-down HQ Sweet Sixteen. Any ideas? Unless the appliqué is very light in color, I would look into using black batting. That makes the dark colors look really vibrant and isn’t noticeable if it does migrate to the top. I use Quilters Dream Midnight Black Poly. Googling hasn’t brought me any answers because every quilt site uses “weight” to refer to warmth or lack thereof, not to lb/oz or kg/gm. I have found bamboo to be really light, and also a thin poly batting would be light. Wool and cotton will probably be a bit heavier. If you like to use all of those battings, though, I’d just get them all and run a few tests – then share your results with us ;). Working on a baby quilt. A rock steady pattern! I usually use 100% cotton thin low loft for baby quilts because it was recommended to me but the more of them I do the more I realize while nice looking they aren’t very cozy and don’t you want to make someone a quilt they could just wrap their baby up in all warm and cozy?? So with that said I want this one to be cozy and warm while still being breathable. What’s best option do you think? I made a quilt for house with wool and love it, so warm and cozy but perhaps wool would be too thick and not as breathable which I think is important for baby quilts. So perhaps Cotton poly blend? If so I’ve never used this before, which blend ratio do you reccomend for baby quilt. Thanks!! 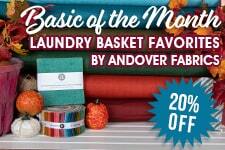 An 80/20 cotton/poly blend is a great choice! I also think bamboo has a beautiful drape. I use a lot of black in my quilts and use the black batting. Love it! I am considering a wool batting … How will I know if my fabric is a tightly woven fabric or has a high thread count? If your fabric is relatively high in quality, it will have a high enough thread count that bearding shouldn’t be an issue. Just saying I use the spray baste, but I have not tried it on a bed-sz quilt. I tape my backing to a tabletop and spread the batting and top, then lift half at a time, starting in the middle, working outward. For small art quilts, I keep a trash bag for covering enough of the table with the can in my kitchen away from my machines. Brand name matters, I recommend the one Hobby Lobby sells, blue can, use a coupon. Right I have Mettler and won’t buy it again. Just finished a table runner which is fine except that the spray gummed up my needle. Only had to change or clean it once. I’ve used pins, prefer the spray because it is simply out of the way, done with care, the quilt sandwich will be perfectly smooth. Good to know about Mettler spray. I’ve never tried that brand. 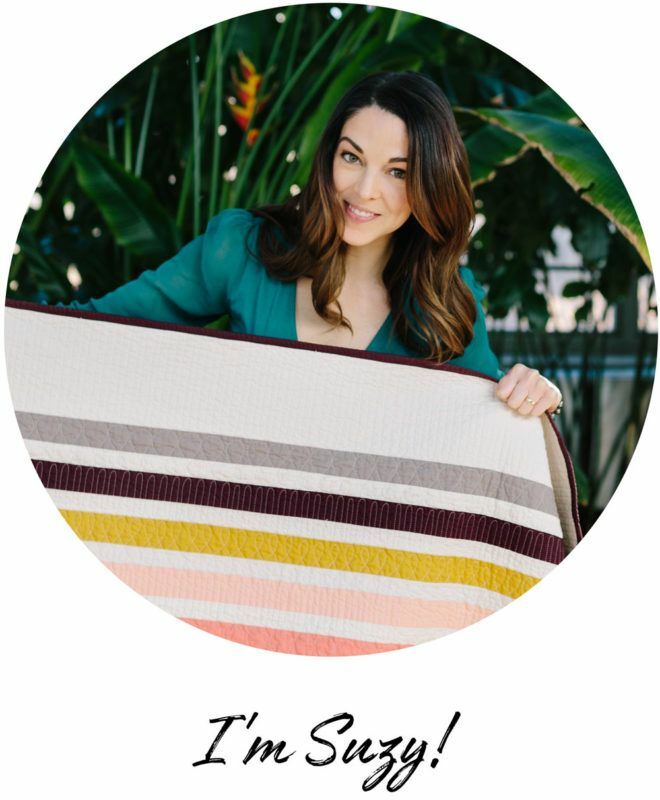 This post was very informative to a quilt novice such as myself. 15 years ago when my mom passed away I began a butterfly quilt using all the pretty floral patterns from her house dresses. Life got in the way and I picked it up again last month. It’s turning into a beautiful California bed sized quilt as I proceed. I’m at the point now where I must choose batting and your information has given me just what I need! Now I must research how to hand quilt this huge quilt in a very small space. I figure to purchase a large embroidery hoop and quilt one square at a time and doing the connecting borders as I go along….in your opinion do you think this is a viable option? If you’re working with a small space hand quilting won’t be the tricky part, basting the quilt sandwich will be. 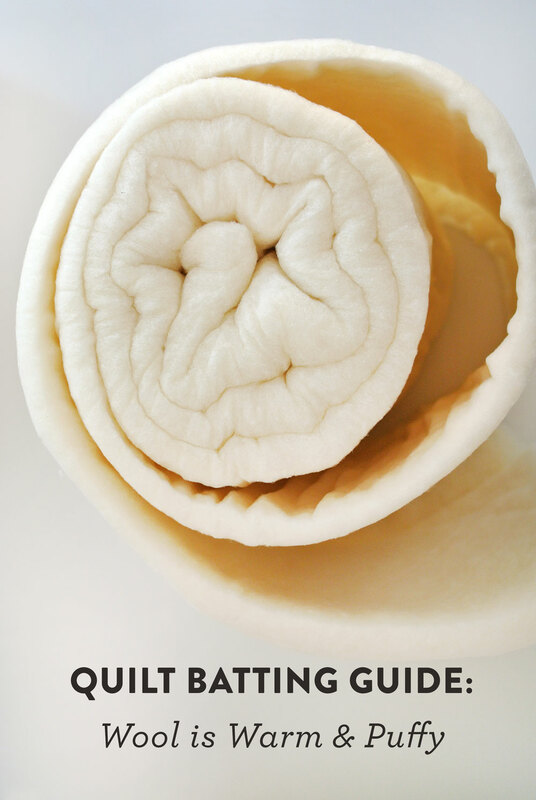 If you don’t want to baste it yourself, you could hire a longarm quilter to do it for you. That’s a little known service most provide. 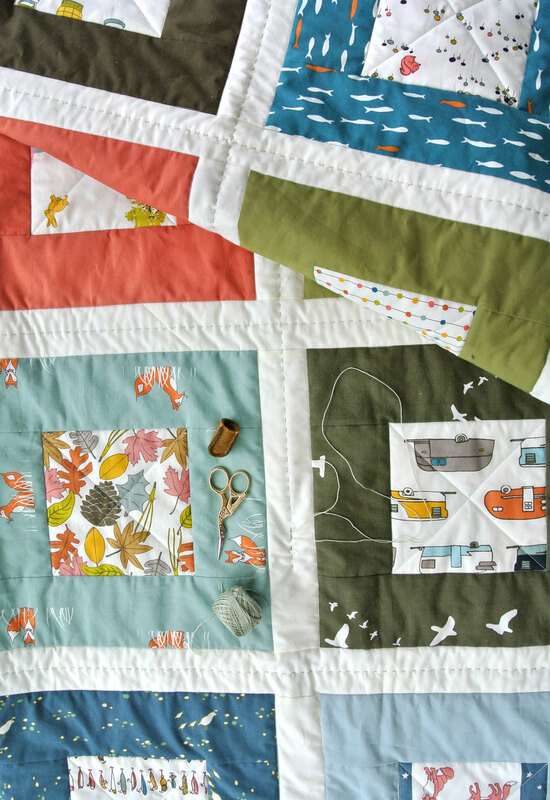 Once your quilt is basted, you can fold, roll or cram it to fit whatever space you’re in. New to sewing? 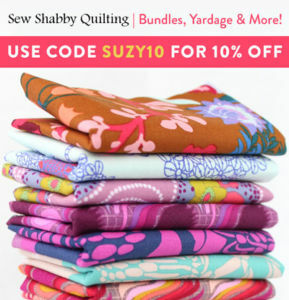 Check out the Quilting 101 tab for everything you need to know to start your first quilt! 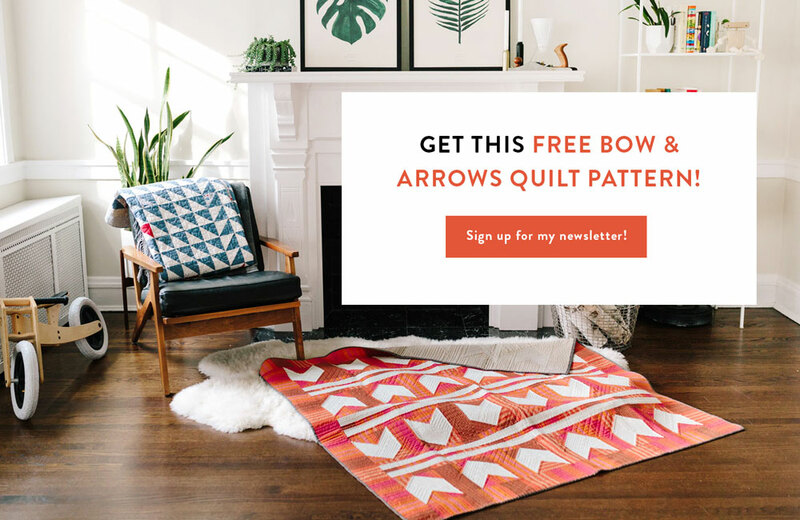 Here at SQ you will find free sewing tutorials, product reviews, basic how-to’s, design inspiration, and quilt patterns geared toward you – the chic, modern quilter! 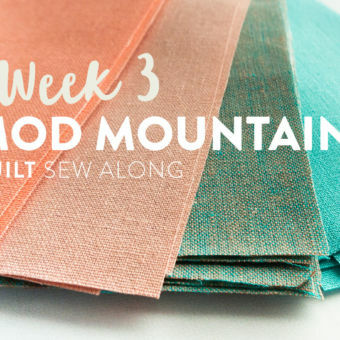 Whether you’re a newbie or seasoned sewist, there’s sure to be something for you to enjoy. Thanks for stopping by and don’t forget to say, “Hi!” in the comments! P.S. Sometimes I recommend products, and if you click on those links, I may earn a small commission. This is one of the ways I’m able to support myself and continue writing free content. You can learn more about that here. Subscribe for coupons, giveaways and the latest news!